The main picture shows a Lancaster heavy bomber with the bulge underneath that houses the H2S radar antenna. Sir Bernard Lovell played a major role in the design of this system and Malvern played a major part in its development. It was needed to assist heavy bombers locate their targets more precisely than could be achieved by existing fixed radio navigation systems that transmitted from the UK. It was the first 10cm ground mapping radar in the world. Radar development in WWII was rapid and evolutionary. The origins of H2S can arguably be traced right back to the earliest airborne radars. Bowen and his team first fitted a UHF radar into an aircraft for Airborne Interception (AI) in 1937 This led on to radar variations to operate against shipping, a class of radar known as Air to Surface Vessel (ASV). The performance limitation of early airborne radar was driven by the limits of power generation and the inability to generate sufficiently high frequencies to achieve a narrow beam for target location and discrimination (resolution). The big radar revolution came in 1940 when a Ministry contract with Birmingham University delivered the answer to this problem – the resonant cavity magnetron operating at high power and at a high frequency of 3000MHz (3GHz) and thus a short wavelength of 10cm. The first experimental production magnetron was delivered to TRE, Worth Matravers and put to work building a centi-metric ASV system for the Maritime patrol aircraft. Its first operational use was as a naval ship borne radar type 271. By October 1941 Bomber Command was demanding a self-contained on board radar bombing aid. Philip Dee of TRE, inventor of the Gee radio navigation system, began to wonder whether a centi-metric radar flying at 10,000ft would be able to distinguish towns from open country and shorelines etc. Experiments were begun in October 1941. 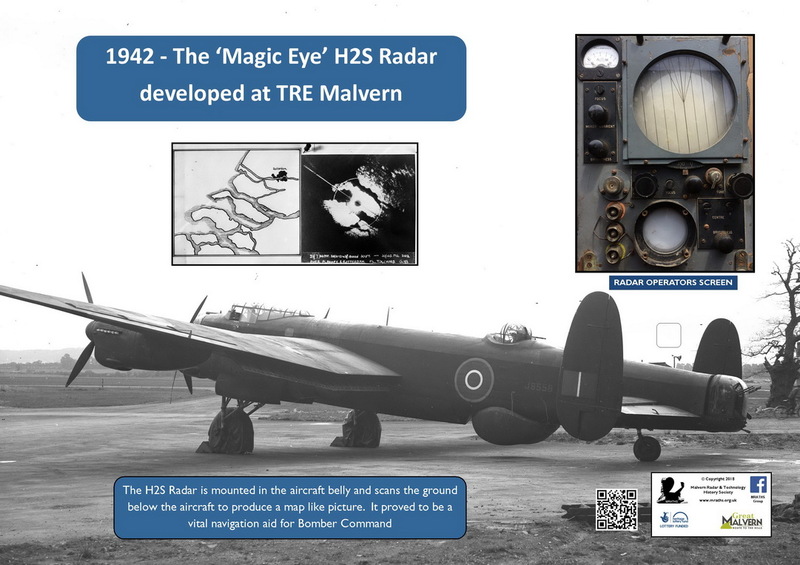 A prototype radar in a Blenheim aircraft flew over Salisbury and Warminster near Salisbury Plain with mixed results. Just before Christmas the decision was taken to conduct 6 test flights and compare scanning with fixed aerials. These were conducted in early 1942 and results issued in a Most Secret TRE Report on 23rd April 1942. The origin of the codename for the radar ‘H2S’ are not clear. Some say it was short for Home Sweet Home, but it was Lord Cherwell who headed Bomber Command that chose the name. By early 1942 the choice of a scanning system was sealed and an order placed for development of the system for the four engine heavy bombers. A Handley Page Halifax was chosen for the demonstration radar fit and Sir Bernard Lovell was appointed to lead the development programme. The prime minister prompted by Cherwell became involved and H2S was given the highest priority. A Halifax, V9977, was delivered to Hurn airport for fitting out. By mid April the first test results were gathered but were disappointing. The political profile of the radar was now raised in relation to the government’s bombing strategy. Around this time the government directed that TRE and its sister Army radar establishment along the coast must be evacuated to a safer place within 30 days. More of this evacuation story can be found under our poster ‘TRE at Malvern College’. 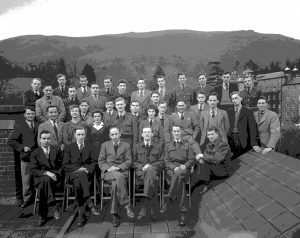 Accordingly, by the end of March 1942, TRE scientists and staff were moved to Malvern College and the Trials Flying Unit was moved to RAF Defford. There was a fierce debate going on between TRE and the ‘Ministry’; TRE wanted to use the magnetron transmitter (~30 mile range) but the ministry said the risk of compromise was too great and were insisting on a klystron transmitter (~10 mile range). In June promising flights in the Halifax were made over Gloucester and Cheltenham. Arrangements were made to give a short demonstration flight to visiting scientists from E.M.I. who were contracted to manufacture H2S. During this flight on 7th June 1942 an engine fire developed which proved fatal to the integrity of the airframe. The aircraft crashed near Welsh Bicknor and all on board were lost as was the only prototype H2S 10cm set. 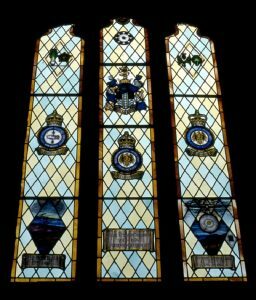 This dreadful accident was commemorated in 1982 with a stained glass window at Goodrich Castle. A Phoenix project, 150 H2S sets made in Malvern. Once news of the aircraft loss reached the prime Minister, Lovell was summoned up to London and ordered to ensure that 200 sets would be ready for the bombers by October. Industry was not able to gear up for this number, EMI could make 50, and so TRE agreed to make 150. These were made in the TRE Engineering Unit off Geraldine Road by the Radio? Production Unit (RPU). 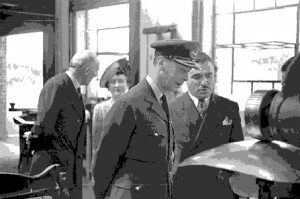 King George VI visited TRE on 19th July 1944 to thank the staff for all their radar work. He was shown how the H2S aerial was made from aluminium sheet, here shown being rolled into profile. Crews had mixed views about H2S. Some preferred the traditional methods of dead reckoning combined with either star or ground sightings, but in heavy cloud this was not sufficiently reliable. By today’s standards, the degree of operator skill required in getting the best out of the radar would be thought unacceptable but as experience grew navigators achieved highly accurate target location. A later addition to the H2S system was called Fishpond. This development arose from a conversation in April 1943 between Gp Captain Saward and Bernard Lovell while walking on the ridge of the Malvern Hills towards the Trig point. This exploited the radar signals emitted directly below the aircraft and provided early warning of fighter attack from below. Targets were displayed on a separate monitor screen.